These professional arborists have a minimum of three years experience in some aspect of tree care and have passed an exam developed by an international panel of experts. The exam extensively covers every aspect of tree care and the individuals must have an acceptable level of knowledge in all areas of arboriculture. Mark Merritt was the first in Hampshire and one of the first in the UK to hold this internationally recognised certificate. He was personally asked to take part in the pilot exam after attending Merrist Wood College, Guildford. A world-leading authority on arboricultural best practice, the Association delivers professional standards and guidance, ensuring responsible management of the trees in our care. Approved by trading standards authorities to provide a reliable and quality service. 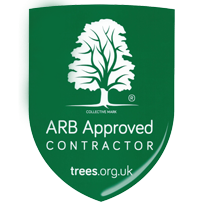 Merritt Tree Specialists Ltd are proud to announce they have recently attained the highly regarded status of Arb Approved Contractor (ArbAC), a national "tree surgery" competence accreditation scheme operated by the Arboricultural Association (a national tree-care industry body, see www.trees.org.uk).